The SP-2 model is used in the same manner as the sustain pedal on an acoustic piano. This classic style pedal works with all keyboards, synthesizers, tone modules, and drum machines. 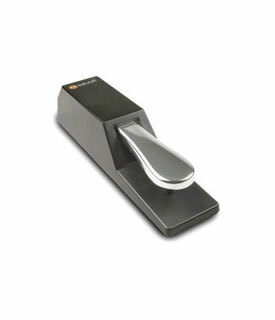 Designed to work and feel just like an acoustic piano's sustain pedal, it has a specially designed rubber bottom that grips the floor and stays put while you play. The SP-2 is a high-quality switchable damper pedal.